TerraKoat International continues to develop innovative products and services that year after year that sets the stage for the stabilization technologies community. Our Research and Development team has formulated countless custom stabilization mixtures to bind soil, sand, crushed aggregate, Decomposed Granite and most any other granular material. It would be great if one stabilizer was able to bind everything. Unfortunately this is not the case. By combining the power of Nature and the knowledge of Science, TerraKoat International has taken the guesswork out of the equation. 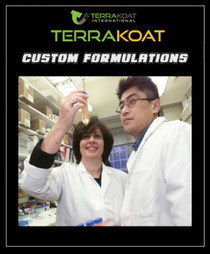 If you would like to have a stabilizer custom formulated for you simply add it to your shopping card below. Upon receipt of your request, you will receive information sheets with detailed instructions for sending in your material.